DirkMD - CMIO Perspective: What is Medicine Reconciliation, anyway? So recently I've been hearing and reading a lot about medicine reconciliation. Medicine reconciliation is the safety practice that, it seems, The Joint Commission has recently announced they will set new expectations for. 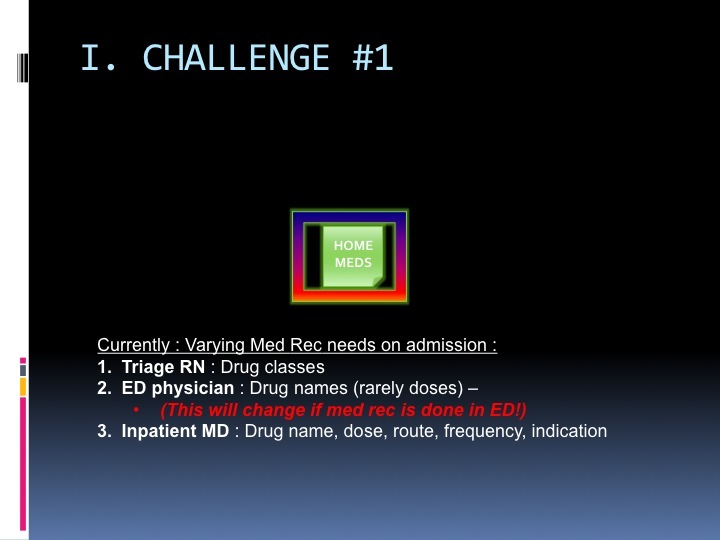 A friend of mine, who went to an IHI conference last year, told me that on a wall full of posters of "problem subjects", the "Med Reconciliation poster" seemed to have the most hospitals reporting challenges. So what is this Med Reconciliation thing, anyway? Is it a mythical creature that people see, but nobody ever really gets a picture of? Is it something that inspires poets and artists, because it's so intangible? Is it something that we can even achieve? Most practicing physicians learned in medical school that it's "good practice to rip up and re-write all the orders when a patient comes out of the OR". 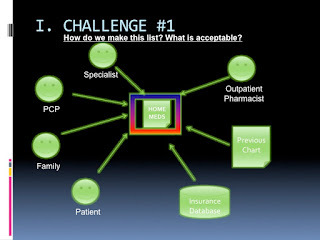 Most practicing physicians are also used to documenting the patient's home medication list in an admission H&P. 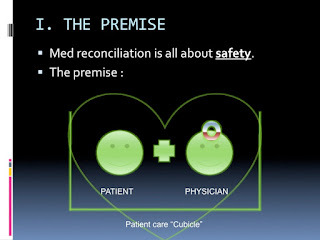 The interesting thing : These are both different facets of the same med reconciliation picture. 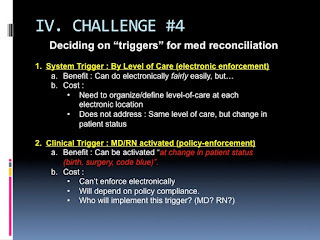 So then, I think one of the biggest challenges in implementing "Med Reconciliation" is that it's so hard to nail down. What is it, exactly? Who does it? And how? So I thought I'd share some answers. First, the premise is simple : It's all about safety. Med reconciliation is built on the basic premise that a physician and a patient work best together, when they're with eachother. For the purposes of this discussion, I've lovingly decided to call the "place where they work with eachother" the "Patient Care Cubicle" (instead of the industry term, "Level of Care" which is a little confusing.). The 'home medication list', to know what the patient is 'usually on'. 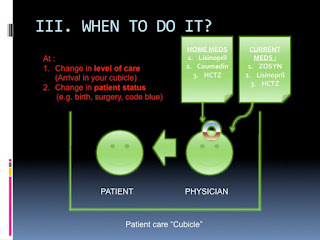 The 'active medication list', to know what the patient is 'currently on' while sitting in this "patient care cubicle". This allows a physician can make the decision : What meds does the patient need to be on right now. So far, so good. Now comes the implementation challenges. The first thing you might do to map out the implementation of med reconciliation, is to make a general map of all of the "patient care cubicles" your patient might pass through, when he/she goes through your hospital. Typically, this map will start with the outpatient cubicle, and end with the outpatient cubicle. 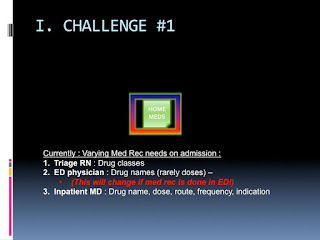 (On discharge, then, you need to do med reconciliation one last time to define the "new home med list", aka the "discharge medication list"). The physician covering the "outpatient cubicle" is the primary care physician. The physicians covering the other cubicles are the ones you assign. 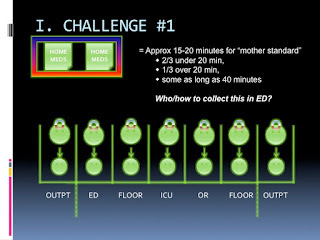 And so if you need two lists - The home med list, and the current med list - To perform med reconciliation, you can see by the above slide that the first challenge will be getting the home med list available in your ED. 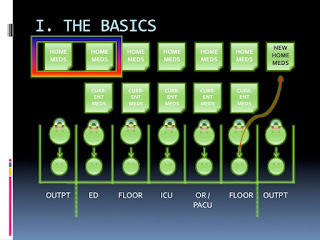 The patient - Who usually knows their home med list... but not always. 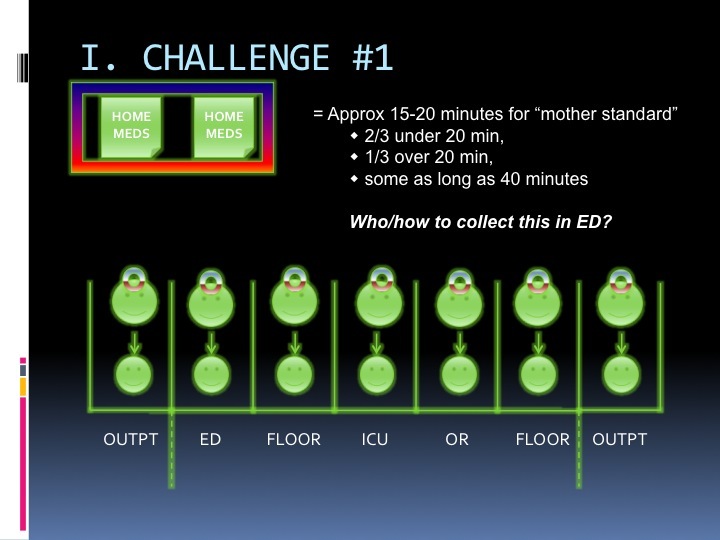 So if the first step is to assemble this list in the ED, then the first challenge is to figure out who will assemble this list, and how? 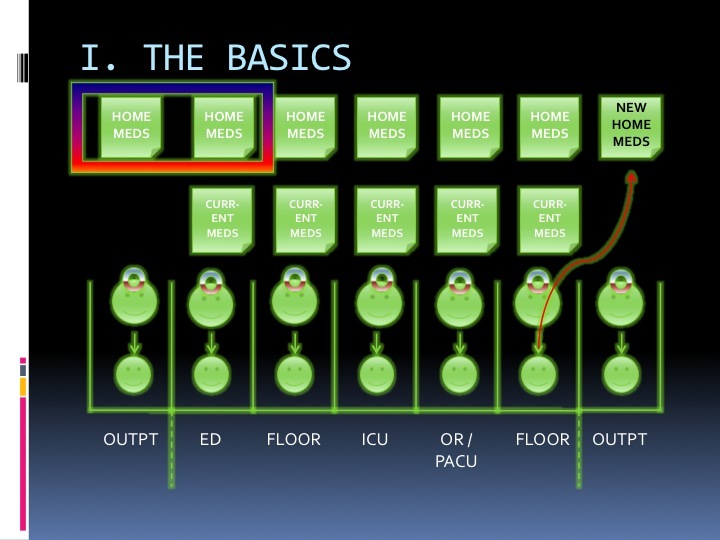 Inpatient Physicians : Here is where the drug, dose, route, frequency, indication, and last dose are most important, because the patient staying in-house will need to continue the right medications at the right times. Because of these varying needs, at these different levels, it's sometimes hard to figure out who's responsible for how much of the puzzle. 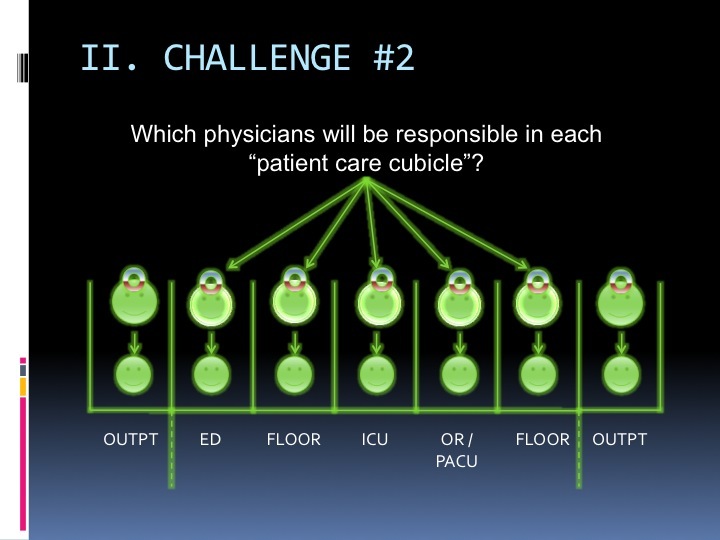 The second challenge, assuming you can get the home med list assembled in the ED, is figuring out : Which physicians will be responsible for actually doing med reconciliation in each cubicle? The challenge for many ORs/PACUs is this : Operating room schedules are tight. Hospitals count on maximum efficiency in an operating room. Even small delays can be magnified into cancelled procedures if everything doesn't run like clockwork. Also : Surgeons and anesthesiologists spend a good part of their day in procedures that simply can't be interrupted. Briefly pulling a hospitalist out of a family meeting to "do med reconciliation" will have a very different cost than briefly pulling a surgeon / anesthesiologist out of a surgery. 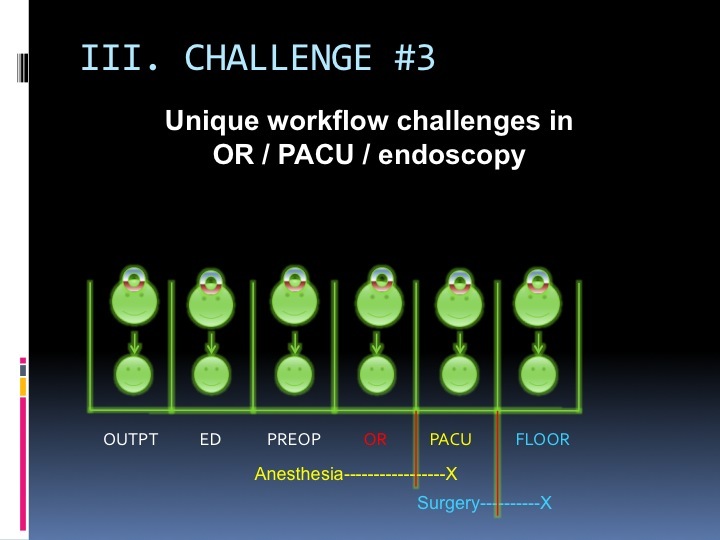 To accommodate with these demands, many anesthesiologists focus mainly on anesthesia meds, and many surgeons write post-operative orders in the PACU. 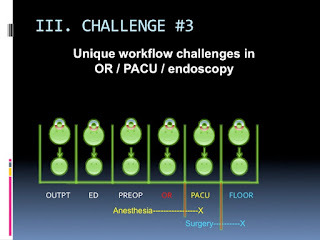 If the patient goes up to the floor, after the PACU, then the nurses depend on the post-op orders written by the surgeons in the PACU. Unless you create a cubicle where the PACU has the same level of care as the floor, you might have to do med reconciliation again after the patient reaches the floor. Figuring out this workflow can be very challenging. It's why my friend, going to the IHI conference last year, saw Med Reconciliation as one of the 'top challenges' hospitals face. Patient arrives in your patient care cubicle (aka "Change in level of care") - This is usually pretty easy to enforce electronically. Patient has a significant change in status (e.g. delivery, surgery, code blue) - This can only be enforced by a policy/clinical practice. 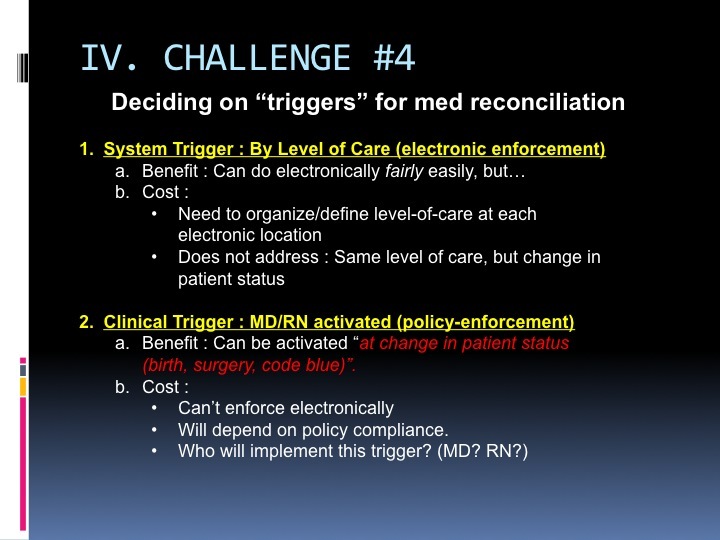 For your EMR to trigger med reconciliation electronically, you will need to organize your levels of care and their relationship to your patient locations. For your staff to trigger med reconciliation during a significant patient event, you will need good policy design and education. Fear not, my reader! This may seem daunting, but the problem can be solved! Many hospitals have started down this pathway already, and many more will continue as The Joint Commission and other regulatory bodies reinforce med reconciliation practices. To help you, I've offered the following recommendations and steps you can take to advance the discussion in your own hospital. Define where this home med list will be kept, once assembled, so that every doctor in the "chain of cubicles" will be able to access it and use it to perform and document "med reconciliation". Define your "patient care cubicles", where your EMR can help trigger the med reconciliation process. 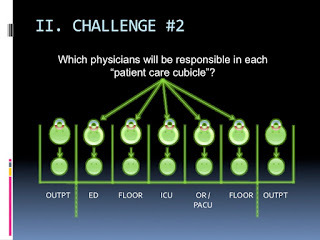 Define which physician's will be responsible for the med reconciliation process in each cubicle, 24/7. Very informative, but why wouldn't a pharmacy technician be considered to collect pt medication info? My hospital experimented with a pharmacy tech in our ER and proved to be very successful.